The problem of students changing schools in the middle of the school year is not new. The consequences of these changes, however, are increasingly dire. Student mobility, defined as students' movement into and out of schools and school districts during a school year, is particularly prevalent among low-income, immigrant and minority children, whose families are often susceptible to changes in housing that precipitate changes in the schools they attend. In an era in which all students are held to high standards, the disruption caused by moving from school to school -- sometimes multiple times within one school year -- can have devastating results for mobile students as well as the teachers and non-mobile students in the schools from which these students depart and to which they arrive. 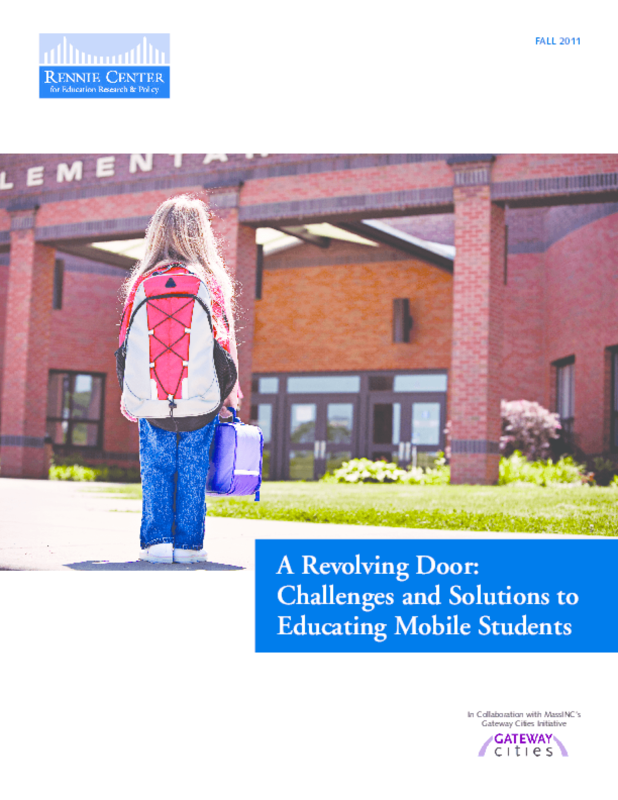 The purpose of this report is to shed light on the challenges associated with high rates of student mobility in order to best identify and disseminate promising strategies for overcoming these challenges -- both inside and outside of schools. The report is intended to highlight the issue of student mobility and focus policymakers' attention on the changes needed in policy and practice at state and local levels to best serve these students. The ultimate goal is to ensure that mobile students are provided with every opportunity to receive the high quality education that will enable them to become successful, productive citizens. This report focuses on districts in Massachusetts' Gateway Cities; in these 11 school districts, 35,000 students moved at least once during the 2008 -- 09 school year, representing 35% of all mobile students statewide. In some of these districts, nearly one-third of the students changed schools during the course of the year. This report describes the scale of Massachusetts' student mobility problem and the challenges student mobility presents in 11 schools in 6 Gateway City districts (Brockton, Fitchburg, Haverhill, Holyoke, Springfield, and Worcester). Findings were gathered from interviews with 43 school and district staff members in the 6 Gateway Cities school districts listed above. promote interagency collaboration to address the root causes of student mobility. The report was the subject of discussion during a public event in Holyoke, MA on September 20, 2011. Copyright 2011 Rennie Center for Education Research & Policy. All rights reserved.